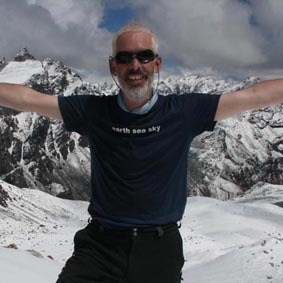 Born in the UK and now based in Sydney, Australia, Robin Boustead has been trekking in Nepal since he fell in love with the Himalaya in 1993. During countless trekking holidays he and a group of friends developed what was initially only an idea for the most challenging alpine trek in the world, the Great Himalaya Trail, from one end of the range to the other. Since 1992 he has been researching new trekking routes in some of the most remote mountain regions of Nepal. He completed a full traverse over two seasons: the post monsoon of 2008 and pre-monsoon of 2009. This epic journey took a total of six months and on both treks he lost over twenty percent of his body weight.